And check out OUR NEWLY LISTED ITEMS. This is the original art to Pg. 18 for the first issue of Preacher, published by DC/Vertigo Comics. It features Jesse, Tulip, and Cassidy, along with the first image of Boot Hill, where the Saint of Killers rests. A great page with the'holy trinity' of key characters together from the beginning of the series by Garth Ennis and Steve Dillon, which has been widely acknowledged as a modern classic. This is one of the most key issues of the Modern Age, and a rare opportunity at a first issue page that features all of the key characters from the issue where they make their 1st full appearance. With an AMC series (like The Walking Dead) set to bring even greater attention to the Preacher franchise, this is a key piece that will likely continue to appreciate. This is a very rare opportunity, so don't miss out on a chance to get an outstanding piece that would look fantastic framed, and would be a key piece in any collection. Check out our other auctions for more great items. Check it out, you'll be glad you did! 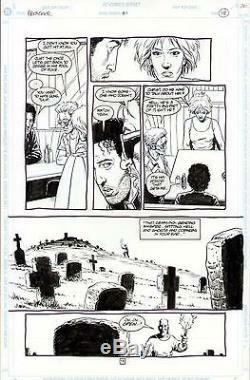 The item "PREACHER #1 ORIGINAL ART PAGE STEVE DILLON JESSE CUSTER TULIP CASSIDY 1ST SOK" is in sale since Wednesday, May 21, 2014. This item is in the category "Collectibles\Comics\Original Comic Art\Interior Pages". The seller is "satchj3" and is located in Brooklyn, New York. This item can be shipped to United States.